As the Clan prepare to open the Great Northwest Athletic Conference campaign at home Thursday (7 p.m.) against the Montana State Billings Yellowjackets, the team is percolating in a most envious state. Head coach Clint Schneider’s Clan, who are finally ready to test their cleats on the home turf of Fox Field, are coming off a perfect 6-0-0 preseason against exclusive U.S. competition in which it surrendered just two goals and recorded four clean sheets, including their last three straight by a combined goals for-and-against margin of 14-0. That’s not even including 3-1 and 3-0 wins over both UBC and Fraser Valley respectively in non-counting friendlies in late August. Put it all together, and a No. 3-ranked Clan team which was grossly mis-cast at No. 20 in the first NCAA national poll of the season, had marshalled its collective might to the point where its focus heading into conference play is right where Schneider wants it. “The goal of the group is to win every game, no matter what the environment, no matter who we are playing against, no matter where we’re playing, no matter the heat, no matter all of those other factors you can’t control,” he said Wednesday before practice. Shy of being forced to play in zero gravity, it looks like Schneider has left no preseason stone unturned. In fact, after being a part of six GNAC titles over the past eight seasons, the last three as head coach and first five as former head coach Alan Koch’s lead assistant, Schneider has neatly crystallized his team’s motto. And the total buy-in and sacrifice from the top of the roster to the bottom has been huge. Sophomore winger Connor Glennon, who scored four goals and added two assists in the Clan’s final two preseason games — respective 5-0 and 6-0 wins over Mary and Oklahoma Baptist last week in Bismarck, ND — was named the United Soccer Coaches Div. 2 men’s National Player of the Week. Glennon’s most recent outbursts have put three Clan players in the NCAA Div. 2’s Top 20 charts. 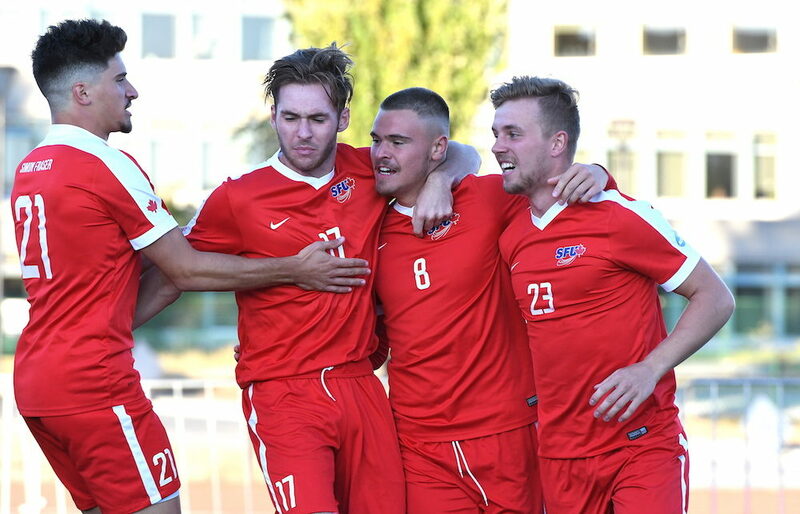 Attacking midfielder Matteo Polisi, the second-year Coquitlam native, has bagged six goals and added eight assists in six games, his 20 points putting him in a tie for second place nationally among all D2 programs. His six goals have him sitting in 14th place. Also among the Top 20 are senior forward Mamadi Camara, the Montreal native, who has four goals and six assists for 14 points, and Glennon, who has five goals and three assists for 13 points. That’s soccer talk for centre forward (9) and attacking midfielder (10). Of course, Schneider is quick to credit Camara who, at that 9 spot, has helped the chemistry work with his efforts at centre forward. Will it be tough to keep the same mindset when Thursday not only brings the start of the GNAC campaign, but also, the team picked to finish third in the standings?